A Simple 3-Step Skin Care Routine! Our skin is the largest organ we have and is one that needs the most attention, but is often forgotten about. It suffers tremendously throughout the day, protecting us from pollutants, UV rays, injuries, weather and that’s just to name a few! We are often asked, what are the necessities of a good skin care routine? For someone who is just starting to take care of their skin, a 6-8 step process can be overwhelming and they aren’t likely to stick with it. 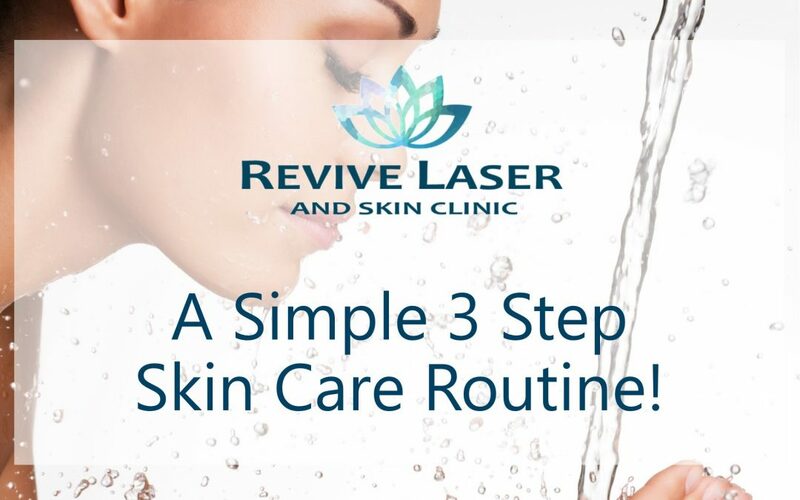 Here are three simple steps that are vital to a basic skin care routine that will still protect the skin internally and externally. Cleansing your skin morning and night will remove oil, dirt, bacteria, pollutants, makeup and dead skin cells that have collected on the surface of the skin throughout the day. Products that are applied to clean skin are easily absorbed and won’t be wasted by being stuck on the surface. Cleansers can be tailored to fit your skins needs whether you are dry, normal, oily or acne prone. Someone with dry skin will want to avoid a cleanser with alcohol and should look for a more cream based solution. Sensitive skin doesn’t like perfumes or additives, while oily/acne prone skin types should find a cleanser with a lower PH level that has an exfoliating property. Routine cleansing regulates the hydration of your skin and prevents the buildup of excess oils, it helps with pore size and is a major contributor to healthy radiant looking skin. Protecting your skin from the inside out with an antioxidant will prevent and improve numerous skin conditions by neutralizing free radicals. Free radicals such as pollution, infrared radiation, UV rays and lifestyle all affect our skin negatively throughout the day. Pure vitamin C (L-ascorbic acid) along with vitamin E (in the right concentration), applied to freshly cleansed skin will neutralize free radicals on the upper layer of the skin. Once absorbed, it is effective for a minimum of 72 hours, so if you forget this step here and there while in a rush, your skin will still be protected. Regular use of vitamin C has visible anti-aging benefits! It improves and prevents photodamage, diminishes the appearance of fine lines and wrinkles while brightening the skin. It is a fantastic, multifunctional product! Skin cancer is on the rise; the ozone layer is depleting daily increasing the intensity of harmful rays. The easiest cancer to prevent is skin cancer yet most of us are not protecting our skin daily. Most of the treatments we perform are all due to sun damage. Brown spots, facial veins, fine lines and wrinkles, premature aging, they can all be avoided and prolonged with the use of a daily broad-spectrum sunscreen that has at least an SPF 30. Find a sunscreen that is going to protect you from both UVA/UVB and the active ingredients are Titanium Dioxide and Zinc Oxide and remember to reapply every 4 hours if you are exposed to the sun’s rays! If you are looking for a simple, basic skin routine that is still going to give you results, these are 3 must have products that can be customized to your skin type or condition. At Revive Laser all consultations are complementary and we can even give you samples to try out before committing.